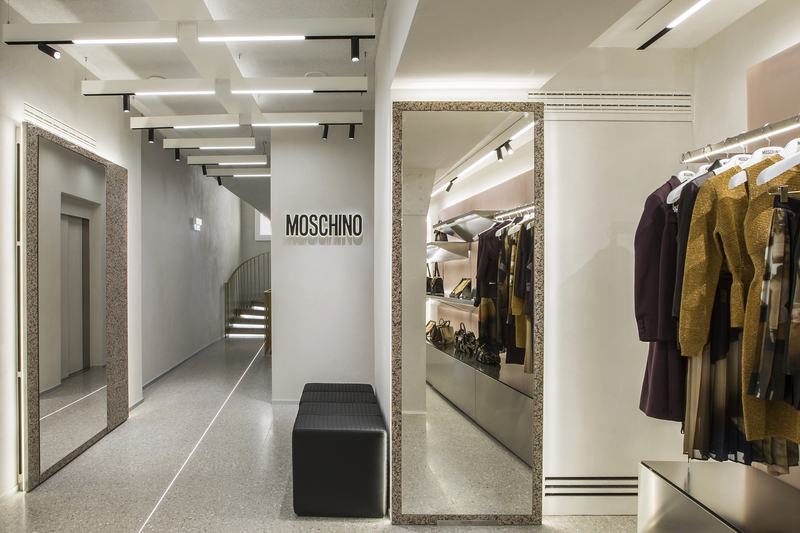 An exquisite touch has been added to the new Moschino boutique on the prestigious Rue Saint-Honoré in Paris by Margraf Fior di Pesco Carnico marble, the world’s only quarry of which is owned by the company. The new flagship store in the heart of the French capital is in a stately late 18th century pierre de Paris building. Creative Director Jeremy Scott chose to give it the form of an exhibition route inspired by contemporary art galleries. Conceived and overseen by the architect Fabio Ferrillo of OFF ARCH, the project faithfully reflects the original essence of the interiors. 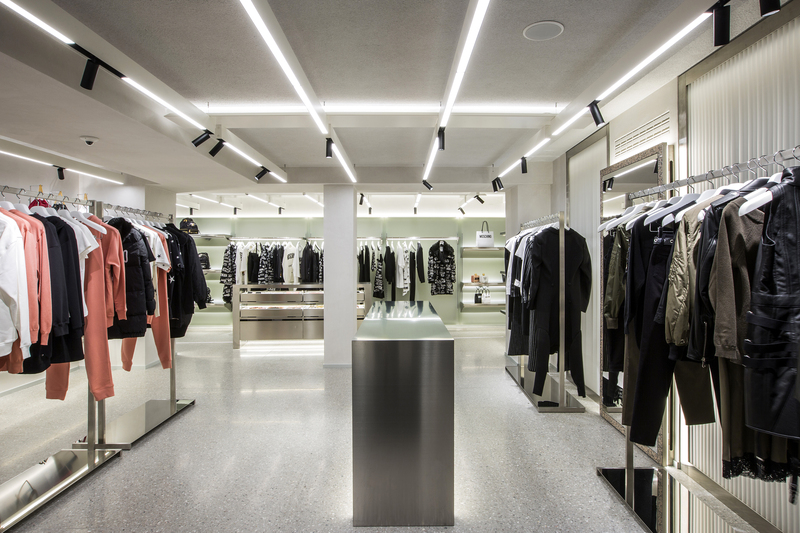 The boutique spans a total surface area of 270 m², spread across the ground floor and the first floor. They are visually connected by a double-height opening at the entrance and an impressive curving staircase that is the focal point of the architectural perspective. The windows by the street entrance immediately engage visitors in an emotional experience, in which a part is played by the natural reflections of the surfaces and a dual illumination system, made up of slender lines of lighting in the flooring. 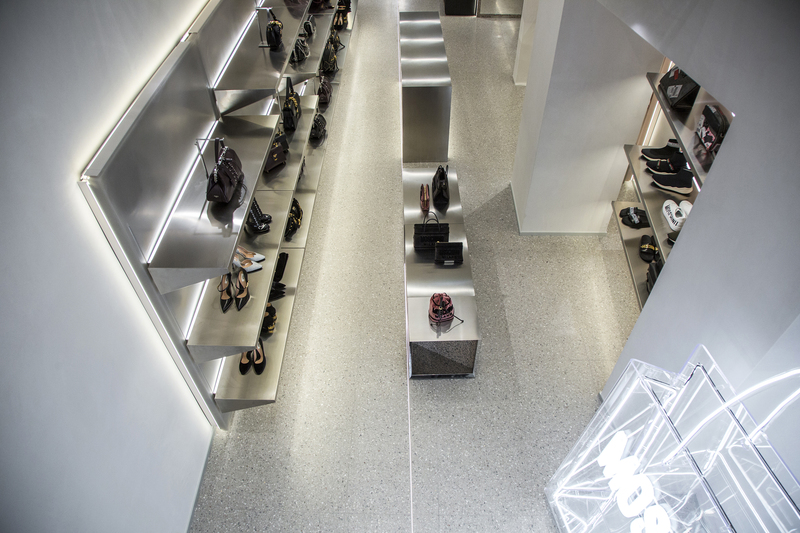 The entire floor surface is covered in exclusive Margraf marble-resin: an agglomerate which is 95% mixed grits of precious Fior di Pesco Carnico marble that are selected for their size and colour. The final effect is reminiscent of Italian Terrazzo. Margraf Fior di Pesco Carnico marble-resin is produced in standard format blocks (305 x 124 x 84 cm) using cutting-edge vacuum technology systems. After being “aged”, the blocks are cut into slabs of various thicknesses for use in places such as floors, walls, staircases, windowsills and ventilated façades. Meanwhile, Pink Juparana granite by the Vicenza-based company was used on the striking LED-lit staircase, the frames of the mirrors, the countertops and the windows, thus helping to create an extremely contemporary and sophisticated atmosphere. 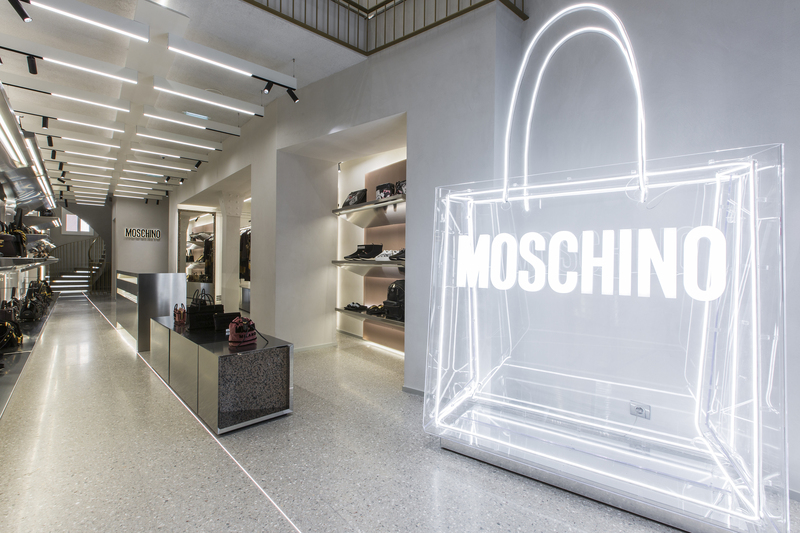 The exclusive customer experience in the Moschino gallery store leads visitors into a stimulating, enthralling dimension that enhances the aesthetic impact of the collections while also contextualizing the artistic, disruptive spirit of the brand, as embodied by the “out of scale” items that have already been introduced in the boutiques in New York and Milan. They make a surprising addition to the Rue Saint-Honoré premises, like real works of art that evoke the image and iconography of the fashion house. They portray shoppers or pumps in an unprecedented way, as they are reduced to translucent outlines and redefined by fine lines of light.